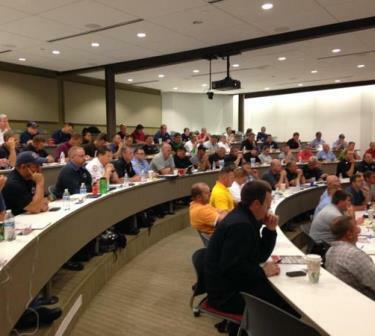 Since 2014, the Foundation has offered regional company officer leadership training at no cost to fire departments across the United States. This training is made possible through a series of public safety grants awarded by Motorola Solutions Foundation, the charitable arm of Motorola Solutions, Inc. The company officer leadership training follows the learning objectives of the International Association of Fire Chief’s (IAFC’s) nationally recognized Officer Development Program, the same program presented each year at Fire Rescue International, the IAFC’s annual conference. Over the past 3 years, the Foundation has been able to provide leadership training to more than 500+ company officers nationally, helping them gain essential skills necessary to successfully transition to their new leadership role. The Foundation thanks the following regions for supporting company officer leadership training: Atlanta, Georgia; Cincinnati, Ohio; Dallas-Fort Worth, Texas; Durham, North Carolina; Kansas City, Missouri; Richmond, Virginia; and Phoenix, Arizona. And thanks to the continued support from Motorola Solutions Foundation, two more regional training programs are planned for 2017. For more information on this initiative, including the requirements to host a training event in your region, contact us.